Interlocutor: I’d like to talk not about Homeopathy. Concretely, who are behind of this therapy, spirits of error or Spirits of Light whose messages were distorted by Samuel Hahnemann? Ruanel: There was influence of spirits of error as well as influence of Spirits of Light. Interlocutor: Does Homeopathy work or not? Ruanel: Let us say that certain Homeopathy can be beneficial because there are some elements that can heal eventually some symptom. But we are not speaking about serious illnesses at all. Interlocutor: Does placebo effect have some incidence? Interlocutor: Let’s see if I understand. 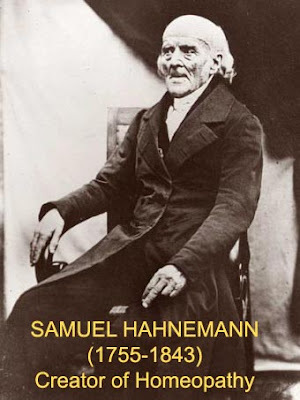 Hahnemann was obviously horrified in his time by the medical aberrant practices, especially phlebotomies, purges, drastic doses of medications that intoxicated the patients and tremendous collateral effects. Ruanel: There were obviously spirits of error enjoying with the pain of the patients. Interlocutor: Master, I want to sum up something: without the Healing Energy and without placebo effect, Does Homeopathy have some validity? Ruanel: There are 30% of possibilities in favor of the patient. Interlocutor: Then, 30% is directly due to the practice of Homeopathy? Interlocutor: According to your explanation, I have to deduce that the principle "similia similibus curentur", which means “like cures like” or the “law of similar” is valid. Am I right? Interlocutor: So 30% of chance of healing is a real effect of Homeopathy? Ruanel: Correct. The mistake, as you say, would be to believe blindly on it, because that 30% is random. Interlocutor: Now I have a clearer picture. The healing, in spite of that percentage, it’s only a matter of chance. Interlocutor: We are always speaking aside from the placebo effect. Interlocutor: What validity does the practice of administering infinitesimal doses have? For example with Bach Flower remedies. I mean to what extent they can be divided without losing validity. Ruanel: Yes, because it has the same effect the hologram has, which although is divided countless times, it always shows the same image. Interlocutor: Was this transmitted to Hahnemann by the Spirits of Light? Ruanel: Correct. In a session I already explained that in an island, certain monkeys acquired a higher peculiar habit that other monkeys in a neighboring island didn’t have, although they could not see each other because these monkeys were separated by the ocean at a great distance and the monkeys of the other island automatically acquired the same habit. Interlocutor: How could that be? Ruanel: 50% is holographic effect. The holographic effect was, on one hand, transmitted in the physical plane at holographic universal level. And the other 50%, the thetans of the monkeys that acquired new habits transmitted to the thetans of the other island and those thetans transmitted them in turn to their 10%. Interlocutor: I don’t understand well that issue of holographic effect. Ruanel: In the planet Earth it was developed by a physicist known as David Bohm who proposed the existence of an undivided mind. It’s not that so, because the thetan is in the middle. But it is true that we, at spiritual level, we are connected with a neuronal network, let us call it in this way, as if it were a spider web. The concept of one is known by everyone, unless I don't want them to read my concept and I “lower the curtain” as you say. But if all the spirits have opened mind  so that we can read each other, then there is a mental communication with all the spirits, and we can have a general knowledge of everything. Interlocutor: Are you referring exclusively to a supra physical level, spiritual? Ruanel: Yes, but we can transmit it to a 10% incarnated, and what that 10% knows can be copied by other 10%. But there is a very small detail, but very important: For example, you in the physical plane are blind and deaf. Very few times you capture what your thetan says, rather almost never, because It is as if you wanted to hear a whisper when there is a noise of a pneumatic drill breaking the pavement closer to you. Then, it is not that a Thetan with easiness transmits information to another thetan and this one to a 10% embodied and in turn to other 10%. This would be an indirect telepathy and it doesn't work like that. Interlocutor: The idea is clear. Ruanel: I warn you, on the other hand, since surely many people will ask you that although we, as spirits, we can contact ourselves with all the spirits and we add knowledge, we will never reach the knowledge of the Absolute [Eon] because we have a limit of capacity. What do we do, then? We simply go discarding experiences that are not interesting to us. It is like your computers, which hard disks have a certain capacity and if you want to continue recording more information, it is necessary to delete the old data. Interlocutor: I never thought that there were limits or that the spiritual mind could be emptied of superfluous contents. Ruanel: This cannot be done with your physical mental decoders because you even keep memories that are useless. You don’t have this technique yet – I emphasize "yet" to get rid of them. Then a moment comes in which your decoder have many data, it records that data in the neurons, and as a consequence, the physical brain due to so much useless information that receives, it goes aging little by little. Interlocutor: It is a very interesting topic to investigate. Returning to the topic of the monkeys, you said that the 10 % transmitted to other 10% the information. Is that correct? Interlocutor: Does that mean that there is direct transmission from 10% to 10%? Ruanel: That is not telepathy . It is a new demonstration of how the mind of all those monkeys somehow formed a kind of a static that was transmitted to other monkeys and in this way they copied the new habits. Interlocutor: Is it a transmission at analytic level? Ruanel: No, it is not at analytic level. It is at unconscious automatic level. It is a new theory to be developed. Interlocutor: Definitely it’s a scientific theory that has base? Interlocutor: All this means that in the physical plane telepathy does not exist, but we are still communicated somehow. Ruanel: Correct. It’s not a rational communication but automatic. Interlocutor: From the spiritual plane, do you perceive that neuronal network you talked about? Ruanel: Yes, of course, from our spiritual plan we see that network. Interlocutor: Before to conclude the topic of Homeopathy I wanted to ask you how the effect placebo works in animals and children? It is a topic that people asked me and I didn't know what to answer. Ruanel: No. My vessel, some years ago has healed a cat from a spinal column problem, and he has healed from a brain problem a baby girl of 8 months and there was no placebo effect. These are healing abilities that my vessel has. Interlocutor: Yes, I know that fact. Is it true what Kumi An said that she was offered to embody with the three healing genes and she didn’t accept because she thought that it was a big mission? Interlocutor: Well, this topic is also clear. The concept of mind is understood as a spiritual concept, on the other hand the brain is entirely physical. Telepathy does not exist in the physical plane, if somebody tells you that he/she can read you mind, it’s a lie. Mediumship, on the other hand exists, but we know it as (spiritual telepathy). Nobody has powers, in the physical plane there are gifts only. This entry was posted at Friday, November 06, 2009 and is filed under Therapies . You can follow any responses to this entry through the .